Matt is a young, yet experienced videographer based out of Sydney, Australia. His ability to shoot, produce and edit gives him a unique eye that showcases the best of his client’s story. Matt’s friendly nature allows for a collaborative experience right through from pre to post production. Throughout his career, Matt has covered a variety of genres, ranging from celebrity profiles, drama, comedy, business, wildlife, sport, science and human interest. Matt’s experience over the years has seen him work with some high profile clients such as Qantas, Rolex, Tourism Australia, Disney, Audi, Mazda, Getty Images and Sky News. Specialising in high quality documentary formats, Matt’s passion is to tell human stories, coupled with beautiful images. 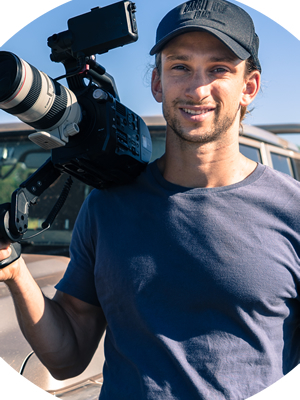 However, whilst documentaries are his passion, Matt has had extensive experience on many different projects, ranging from TVCs, live events, Tropfest finalist short films, television programs and multi-national campaigns. Priding himself on being a ‘Jack of all trades’ Matt enjoys the variety of his work. Matt’s skills across audio, lighting, editing and shooting make him a valuable asset to a production that is looking for a smaller crew. Working for years as a solo operator, Matt has the ability to work independently but the experience to collaborate with larger crews, should the job dictate it. Passionate, reliable and committed to delivering exceptional content, Matt’s competence coupled with his interpersonal skills guarantee excellent results. Matt has done a number of shoots with us now and we’ve been incredibly happy with the result of each. His ability to quickly comprehend our goals and give real-time direction with how best to achieve these has been indispensable. Thanks Matt! Matt is an amazing guy to work with. He always brings his A game to a shoot and the results are incredible!!! I have had the pleasure of working with Matt on three major film projects with our company and he continues to impress me on his skills and technique. From his cinematography and keen eye through the lens, documentary style work and editing skills, Matt produces the highest, finest masterpieces for our customers. He understands what the customer is seeking and captures the story from start to finish brilliantly!! I would highly recommend his services to the individual, couple through to small and large corporates. Matt’s a true professional and I’m continually blown away by the quality of his work. He is a extremely talented shooter/editor and his ability to tell story is phenomenal also. I’ve employed Matt to represent my company on many occasions and his always done an amazing job. A serious amount of talent in this guy and always great fun to work with. A true star! After working with Matt on a couple shoots now I have been super impressed with his high level of organisation and tenacious work ethic. His pragmatic approach to his work and as his ability to remain relaxed and professional in any situation has made him my top consideration for any future projects. I was extremely impressed with Matts work ethic and ability to get the best results. He was personable, professional and meticulous throughout the project. I would highly recommend Matt. Matt is a wonderful person to deal with. We work together on multiple projects regularly. He will always go above and beyond for everyone he works with. One of Matt’s strengths is his ability to manage projects from start to finish seamlessly. Having him on the team always makes the process seem simple and easy. His calm nature means you always feel at ease whenever you’re working with him. The quality of Matt’s work is always outstanding and he will always go above and beyond to deliver! I can’t wait to work with him again soon! I hired Matt to do a wedding video and was not disappointed. Since then he has done 2 other projects for me and his attention to detail and unique editing style are incredible. He is very open to input and allowed incredibly patient with his process. Would recommend without reservation. I have commissioned Matt on a number of projects for delicious Magazine over the past couple of years. From studio days to location shoots interstate, Matt has always delivered a quality product on time, and as a bonus is very easy and fun to work with! The ability to capture the essence of the story, the sensitive way he deals with his subjects, a true appreciation of visual aesthetics, a meticulous eye for detail and his consummate professionalism makes Matt a pleasure to work with. I’ve worked with Matt over many projects for a few years now. I can guarantee he will always deliver a project with professionalism and creativity every single time. On top of that he’s just a really great guy! Highly recommend!